Hurry up with shopping: this great sports camera now costs only 360 PLN. And with a selfie stick! I would even be able to assume that at this price you will not find anything better than Yi 4K. So where is the catch? You have to hurry with the purchase. We have a classic accumulation of promotions. Not only that, the company has overestimated this equipment in its official store on the German Amazon , but the shop itself tempts customers with promotional coupons worth 45 euros. And in this magical way, the equipment, which normally costs 179 Euro, you can buy for 85 (130 euros less by 45 euros) and together with a selfie stick. We advise you not to use the default conversion rate for Polish zlotys used by Amazon. It will be better if you pay, for example, Revolut. What can Yi 4K do ? This is the second generation of a sports camera, formerly known as Xiaomi Action Cam. The most important changes to the previous model are certainly the ability to record 4K movies at 30 fps and image stabilization. Although it is digitally implemented, but taking into account the promotional price, there is no point in complaining. Other amenities include a touch screen, covered with Gorilla Glass. The touch makes it much easier to operate the camera, which does not require - as it was in the previous generation - to pair it with the mobile application on our smartphone. The battery with a capacity of 1200 mAh, according to the manufacturer's data, allow 2 hours of recording in 4K / 30 fps mode. The battery is, of course, interchangeable. In addition to the 4K recording mode, Yi also allows you to record movies in a higher frame, so you can play in the recording of shots in slow motion. In 1080p the camera records the image in 120 fps - if it is still too little for someone, you can always switch to 720p mode and record in 240 fps. Fans of extreme sports should be satisfied. Yi 4K also takes pictures at a resolution of 12 million pixels. The matrix used in it is a 1 / 2.3 "Sony IMX377 transducer. It is additionally supported by the A9SE75 image processor, known from the Gopro Hero 4 cameras. The lens has f / 2.8 light, offers an angle of view of 160 degrees and is made of seven glass lenses. The camera can be connected via both Bluetooth 4.0 and Wi-Fi (in 2.4 GHz and 5 GHz). Is it worth buying a Yi 4K camera? The Chinese manufacturer is the undisputed king when it comes to cheaper equipment. Karol, moreover, had the opportunity to test this model on his private channel and stated that it is GoPro quality at half the price. 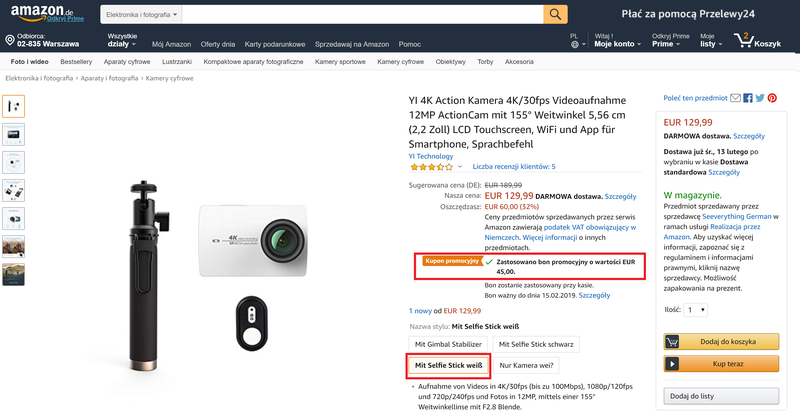 Added to this is the Amazon promotion (together with free delivery to Poland), so if you were looking for a cheaper sports camera, then there is no wonder. Instead, you have to hurry up. Buy Yi 4K on the German Amazon .